As you know by now, I live in a mixed marriage that is – interracial and interfaith. When I met my husband, it was obvious to me that there is no legal obstacle for us being together and getting married given that we lived in Great Britain. A mixed marriage is a marriage (in general) between individuals of different races, religions or ethnicities. In most countries today, people are permitted to marry whomever they want. They can mix, blend, and create fabulous fusions. It sounds so simple and easy, doesn’t it? Unfortunately, it was not always like that. In the past, interracial marriages were forbidden and criminalised in several countries of the world. Although the USA is considered to be the finest examples of democracy, freedoms, and equal rights, interracial marriages were prohibited and penalised in many states until a landmark 1967 Supreme Court decision (Loving v. Virginia case) invalidated all anti-miscegenation laws (which were enforcing racial segregation) and deemed them unconstitutional. Great Britain, which is where I work and live, implemented several anti-miscegenation laws in India (then still a British colony) right after the Indian Insurrection of 1857 (also known as India’s First War of Independence, the Great Revolt, the Sepoy Mutiny or the Indian Rebellion) and were in place until India won independence in 1947. Interestingly, in Britain itself, there have never been legal restrictions against interracial marriages. In addition to prohibitive laws, mixed marriages also face the challenge of union due to partners’ different religious affiliations. Unfortunately, this issue is still ongoing in certain places in the world. Interfaith marriages are legally banned or restricted mostly in countries with theocratic governments where the legal system is based on religious laws, such as Saudi Arabia. However, there have been implemented changes and improvements towards the right direction- the freedom of choice. If you are interested, here is my article about Our Happy Multifaith Catholic Sikh Family . On the positive side, mixed marriages are nothing new. We may not have called them that but they have existed since time immemorial. Millions of our ancestors had entered mixed relationships that helped to shape current world population. Then why do mixed marriages in some parts of the world still raise eyebrows? Our history gives us wonderful examples of people from various ethnicities (even races) who have existed side-by-side and created uncountable number of mixed relationships. The best example of this is the Indian subcontinent. While not without its own set of cultural issues, it has a long and significant history of interethnic marriages dating back to ancient times. In South Asia, separate groups of racially/ethnically different people have been intermarrying for centuries. Moreover, this region is also known for its religious diversity where Hinduism, Islam, Christianity, Sikhism, Buddhism, Jainism, Judaism and Zoroastrianism coexist till today. Although Hindu-Muslim marriages mostly don’t happen (or rather are exceptionally rare due to historical issues), mixed marriages between Sikhs and Hindus are much more common. While a Catholic-Sikh union may not be quite common either, once we started dating seriously, we knew we had to obtain a formal ‘acceptance’ or ‘agreement’ from our parents to continue our relationship before we could get married, because we were with someone outside our ‘normal’ (racial/ethnical/religious/social) group. Fortunately, we both have wonderful parents who accepted our love and agreed to our marriage. I don’t even want to think about what would have happened if they didn’t… Lucky stars and God’s blessings were with us. However, not every couple is that fortunate. Mixed marriages and mixed kids still sometimes face a sort of stigma- rejection, discrimination, a lack of understanding or just a curious look. I know many couples who cannot get married or get married against their parents’ wishes. Skin colour or a different religion should never be a reason for disapproval even though, sadly, sometimes that is indeed the case. Mixed marriages are great examples of love, respect, compromise, strength, and courage. In general, our societies have made a significant progress in terms of mixed marriages. Relationships like mine are more common and more easily accepted than they were in the past. Although there are still struggles and obstacles along the way, mixed marriages are also slowly becoming ‘socially legal’ worldwide. This article was first published on theParentVoice- online parenting magazine. Living in Laguna Beach, California everyone has mixed marriages of EVERY kind and is so normal I didn’t think anything of it….till I moved. It must be difficult to feel so differently in society. Glad you wrote this post to enlighten others! Btw: What a fabulous family you create!!!!!! Wow I love it!!! and have utter respect for you and your husband. Beautiful kids and great parents. Amazing example for others. Is it “socially legal?” I like the topic. Of course, little ones are always an affirmation – a “yes.” But especially with your adorable little one…a definite YES! I miss those days. My “little one” is now taller than me and shaves (lol). “Mixed marriage.” Ug. So many restrictions. If my Irish grandfather lived to see me marry an Italian, he would have flipped. Both European (and the same religion). Go figure. “Fabulous fusions.” Love that phrase…Fabulous Fusions. I never knew Great Britain never had any legal restrictions. Very cool. With respect to India, I always thought that the “Cast” system absolutely prohibited people from marrying, to the point of being shunned and outcast. I know that there’s a lot of diversity, but I always thought the Cast issue was absolute. I’m not challenging you, just very curious. Glad to hear all the parents were supportive. That always means so much. “Mixed marriages are great examples of love, respect, compromise, strength, and courage.” – Love that! Well said! I tend to shy away from religious or political topics, but as a Philadelphia Quaker I couldn’t agree with you more. Philly Quakers believe that there is a “Divine Presence,” a “That of God within” inside all people. What more do you need? Love is love and everyone’s invited to the party. I assume you are Irish and you have Italian husband- fabulous 🙂 you both create European fabulous fusions and I am sure you are an inspiration for others. Regarding India- you are right, to some point 🙂 India’s caste system used to be quite strong and, sadly, somehow more or less still exists. Fortunately, there are a lot of people out there who happily break either the caste system or the religious limitations. Many famous people in India set a great examples for others to follow and create interfaith marriages e.g. Shah Rukh Khan (Muslim) and Gauri Chibber (Hindu/Brahmin), Saif Ali Khan (Muslim) and Kareena Kapoor (Hindu), Riteish Deshmukh (Hindu) and Genelia D’Souza (Christian). 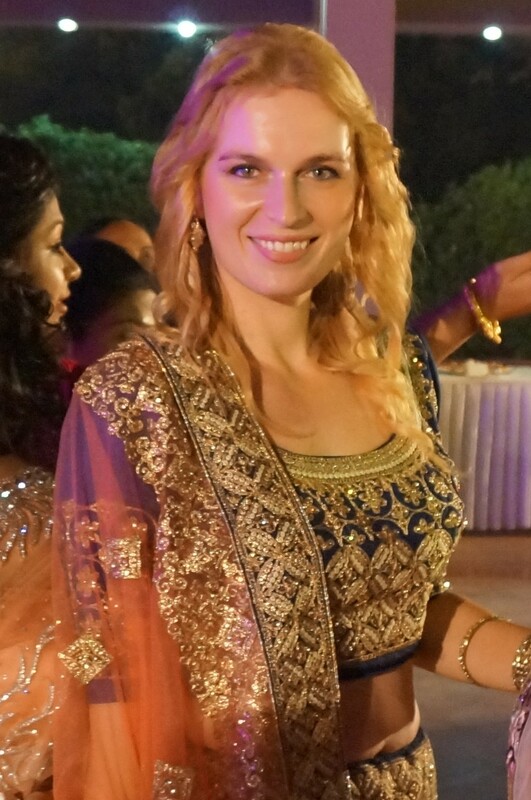 Moreover, I have many examples in my husband’s family and among our friends where Hindu Brahmin married different (lower – sorry, I hate writing about lower/higher Hindu, but have to write it now in order to describe the marriage) Hindu, Sikh married Hindu, Hindu married Christian or Indian Sikh married white Catholic from Poland (my husband :P). I hope this tendency will continue and we will see the India’s caste system falling apart quickly. As you wrote, luckily, we both have fabulous parents who have always supported us 🙂 I wish the same for everybody. Thank you! And you keep going stronger and better 🙂 Travelling is so addictive, isn’t it ? What a lovely family! Anyone who sees anything wrong with “mixed” marriages, and sadly such people do still exist, is very small minded. Best wishes and thanks for visiting The Glasgow Gallivanter. Definitely best not to bother! My brother-in-law’s parents came from the West Indies, and when he and my sister first got together I used to seethe at the filthy looks some people gave them. 30+ years later it does seem a lot better so there is some progress. Glad you liked my blog, thanks. You are a beautiful family! I’m mixed 50-50, but my parents were of the same faith. This is a wonderful article. Thanks for sharing. Poruszyłaś bardzo ważny problem. Cieszę się, że powróciłaś. Lovely to see you here. Wow, your family (Black/White/Latino) creates such a fabulous fusions! 🙂 I’m sure you guys are an inspiration for many people. I’m so happy to hear that you have never experienced ‘raised eyebrows’. It should be like that- always. I’m lucky to say that I have never experienced any raised eyebrows/bad attitude towards me and my husband in the UK. We are just a random, common couple. However, in our homelands (Poland and India) people turn heads and look and look… It doesn’t mean they look at us in a negative way, but overall we feel a bit different. Although, it’s important to emphasise that we have never been in a situation when someone directly said something ‘politically incorrect’ towards us.